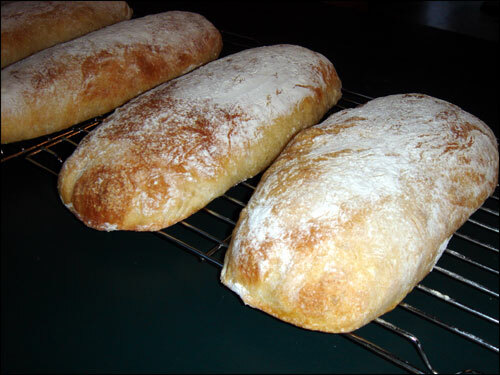 I love ciabatta (pronounced Cha-Bata) for its crusty outer and soft, chewy interior. It is fantastic fresh and toasts up a treat. My new part time bakery job inspired me to try making some at home. I’d always thought it too tricky for home baking, but while ciabatta is a bit fiddly, it’s not beyond the home cook. This recipe is from Tim Allen’s great book – The Ballymaloe Bread Book. This makes 4 big loaves or about 10 smaller rolls. Make the biga by stirring the yeast into about 50ml of the warm water. Leave it until the yeast has dissolved and is creamy (about 10 mins). Stir in the remaining water then the flour. Put the biga into an oiled bowl, cover with cling film and leave at room temperature for 12-24 hours. It will double in size, look wet and have a strong fermented smell when it’s ready. Add the yeast to the warm milk. Let it stand for about 10 minutes. Add the water, oil, flour,salt and biga. You can use a mixer with a dough hook if you have one or do it by hand – by hand is more fun (and authentic) as long as you don’t mind getting messy. Using a scooping motion, mix everything together, folding it in from the sides of the bowl. Do this for about 10 minutes until the mixture is stringy and pulling away from the sides of the bowl. If you keep one hand clean to hold the bowl and use the other for mixing, clean-up is much easier. Put the dough in an oiled bowl and cover with cling film. Leave somewhere warm for 1-2 hours to rise again. The dough should double in size and be full of air bubbles. The texture of the dough should be supple and elastic and quite sticky when fully risen. Carefully turn the dough out onto a well-floured work surface, being careful not to flatten it or squash out the air bubbles. Using a knife or spatula, cut the dough into 4 or more pieces. I find 4 loaves are a good size for filling but smaller rolls are nice too. Preheat your oven to 220C. Generously flour two baking trays and place the pieces on them, allowing roow for the dough to spread a bit. You can shape them a little but again be careful to preserve the bubbles in the dough. Sprinkle flour over the loaves and leave them to rest for 30-45 minutes. Before baking dust more flour over the loaves. They might have spread sideways a bit but you can scrape them back into shape with a long spatula if they are too wide. Bake for 20-25 minutes and cool on wire racks when done. » The Comfrey is Sprouting!